After WWII the first thing German people bought during the "Wirtschaftswunder" time was one of those funny little cars. 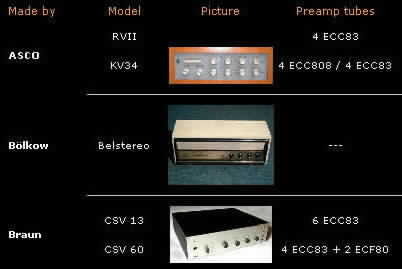 HiFi was still far away and so the list of German stereo tube amps is short. You find two tables - one showing integrated amps and the other showing power amps - with brief information and the tube complement of all tube amps. Integrated Amps <- Klick here! as from Braun, Dynacord, Dual, Elac, Heli, K+H Telewatt, MEL, Perpetuum Ebner, Saba, Sennheiser, Telefunken and others. 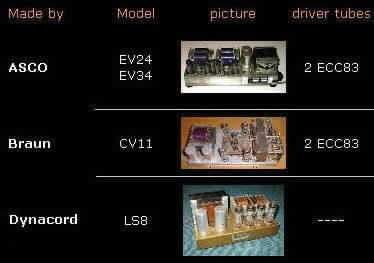 Power Amps <- Klick here! from Asco, Braun, Dynacord, Graetz, Grundig, Nordmende and Telefunken. Also including power amps from radio consoles. Click here to view the special section for Siemens / Klangfilm tube power amps, preamps and speakers.